Are you an apprentice in the manufacturing, building or construction industry? Did you know that there are over 3000 products that contain asbestos? Or that two out of three houses built prior to 1987 are likely to have products that contain asbestos? 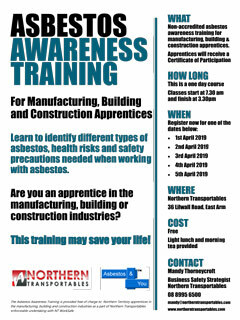 Northern Transportables is providing free asbestos awareness training to Northern Territory based apprentices in the manufacturing, building and construction industry. This is a non-accredited course delivered by Registered Training Provider Asbestos and You. In this course you will learn to identify different types of asbestos, health risks and safety precautions needed when working with asbestos. All participants who complete the course will receive a certificate of participation and a Blue Card from Asbestos and You as evidence of training. Places are limited! See attached brochure for further details and register your interest below. 2. Please list any special learning requirements. We will be in touch to discuss details. 4. Please select preferred training date. Please note we are limited to 20 places per day. While all efforts will be made to accommodate your preference we cannot guarantee a place on your preferred date. Copyright © 2018 Northern Transportables, Darwin NT. Another House that's been reinstalled. This one has been delivered and stumped in the Katherine area. If you're interested in getting one of these houses for yourself don't hesitate to get in touch. Northern Transportables currently has a two bedroom display unit available for viewing at its Lilwall Road Fabrication Facility. The display unit showcases a number of finishes and fitout options. Drop in anytime between 8am and 5pm to view what could be on your block in just a short couple of weeks from contract signature to install. Northern Transportables would like to advise that there will be an open house held in one of the buildings recently relocated from the RAAF Base. The house is located at 107 Marjerrison Drive Humpty Doo and will be open for viewing from 12-2pm on July the 5th.